Even though most surgeons are reluctant against L-PPPD for malignant lesion of pancreas head because of oncologic point of view yet, if technical feasibility and safety are verified, L-PPPD can be accepted as an alternative option for open pancreaticduodenectomy. (Purpose) The purpose of this report is to present the clinical outcomes of the L-PPPD to verify the feasibility and safety and to compare the laparoscopic assisted PPPD to totally laparoscopic PPPD in a single institutional study. (Patients and method) 16 laparoscopic assisted PPPD and 5 totally laparoscopic PPPD were performed since May 2007 for 18 benign and 1 endocrine carcinoma and 2 invasive malignant neoplasm. For laparoscopic assisted PPPD, reconstruction was performed extracorporeally for pancreaticojejunostomy, duodenojejunostomy and jejunojejunostomy through the specimen removal wound, and choledochojejunostomy was performed with intracorporeal laparoscopic For totally laparoscopic PPPD, all procedures were done intracorporeally with extraction of specimen through the small pubic line. (Results) There was no operative mortality in both groups. 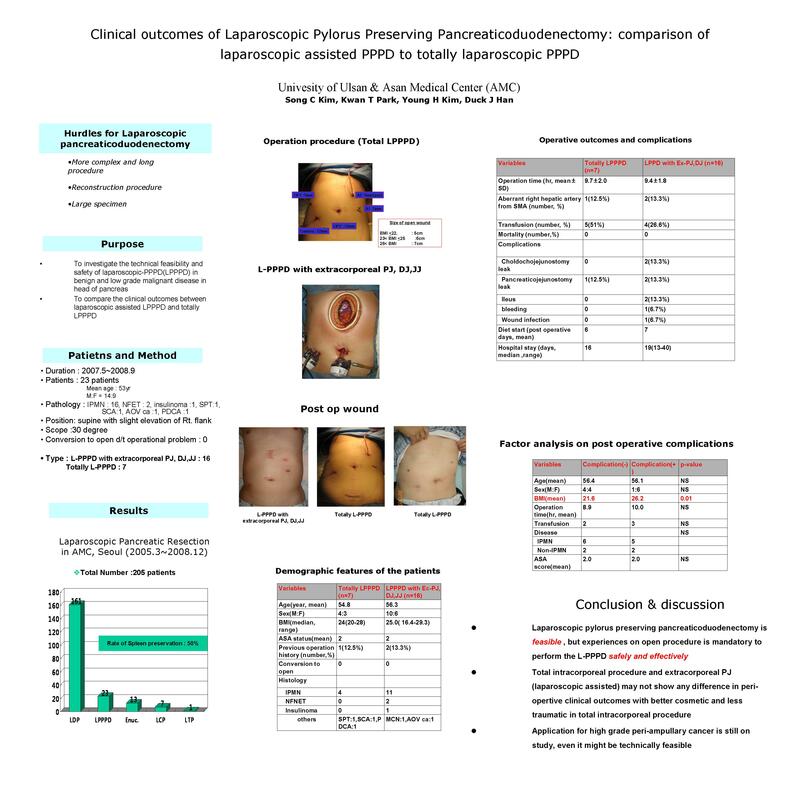 Median operative time (from the time of skin incision for the first trocar to the time of skin closure of the last port ,including resting time for surgeons) was 9.4hr in laparoscopic assisted PPPD, and 9.7 hr in totally laparoscopic PPPD(P>0.05). Postoperative complications were developed in 7 patients (46.6%) in laparoscopic assisted PPPD including two(13.3%) cases of pancreatic fistula and three cases of biliary fistula, and one case of pseduaneurysm bleeding in laparoscopic assisted PPPD. There is one case of PJ leak in totally laparoscopic PPPD. Hospital stay was similar in both groups. High BMI was the only significant factor for postoperative complications (Conclusion) Technically, L-PPPD is feasible with acceptable mortality, and totally laparoscopic PPPD could be performed with comparable results to laparoscopic assisted PPPD However high morbidty in high BMI patient remains as hurdles to overcome for LPPPD to be a standard procedure.